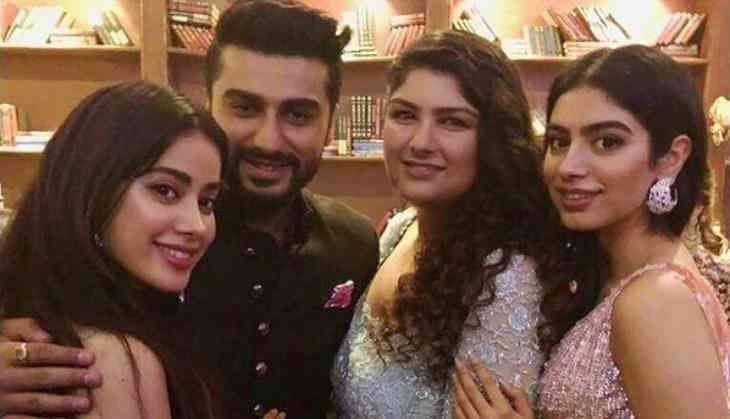 Today the superman and Salman Khan Ka Fan, Bollywood actor Arjun Kapoor is celebrating his 33rd birthday and it is like a very dear function for the Kapoor family. Yesterday, the Tevar star celebrated his birthday with his father and sisters Anshula, Janhvi, and Khushi Kapoor. Now his all sisters took the platform of social media to wish the 2 States star on his birthday. Janhvi Kapoor daughter of Sridevi who is all set to make a debut on the silver screen with Dhadak took the Instagram to wish his Bhaiya on his birthday. Then, Anshula Kapoor, the only sister from his mother Mona Kapoor took the Instagram to share the most lovely and cute childhood picture of both. Her caption to the image is something that will make you emotional. This is to notice that Sonam Kapoor is in London these days enjoying her honeymoon period with her husband Aanand Ahuja.